When you start to see unreleased devices begin to grace the Best Buy Buyer’s Guide with the connotation of “coming soon,” you know that the undeniable reality is coming sooner than you think. Chiming in on time as we begin to close out April and embrace May, both the Samsung Droid Charge and HTC Droid Incredible 2 are gracing the pages of Best Buy’s mobile focused magazine – thus shedding more truth to their inevitable release. From what we’ve seen already, the “coming soon” remark seemingly solidifies the April 28th date we’ve been hearing attached to the Samsung Droid Charge’s launch. 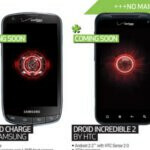 However, there’s still yet to be any kind of indication from Verizon that the Droid Incredible 2 actually exists. Nonetheless, you can’t help but think that a powerhouse company like Best Buy is in the loop regarding such things. So when you see unreleased devices grace their Buyer’s Guide, it undoubtedly yields to a strong likelihood that they are indeed for real – then again, maybe not. Personally I think that Samsung should stick with their Galaxy S line-up since they do those so well, though I can't deny that it will be interesting to see them do a Droid, but... the Droid Incredible 2 has my attention. It's just a much better looking phone. 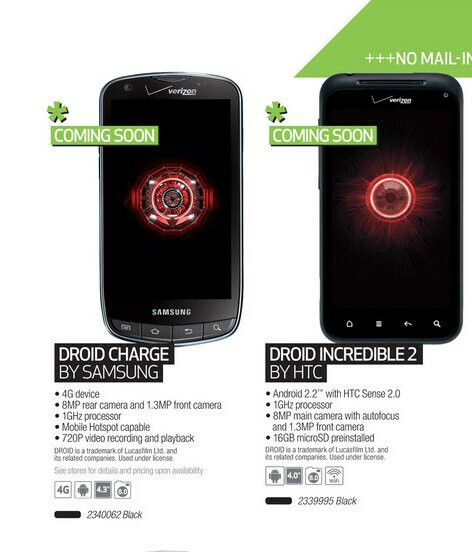 The Droid X2 has my attention as well. Like a lot of folks, I troll the phone sites daily...looking for a glimmer of hope of the one device that'll deliver every mobile dream option I've read, and a few choice things I didn't (who wouldn't want a 3D tappable image of a daily calendar? EVO 3D...wassup!). My issue is carrier and hardware. You're stuck for 2 years minimum so you want a beefy hardware package that can handle any ROM or upgrade that comes. I'm now watching my friends and family upgrade to Android, IOS, and Symbian - I'm stuck in a WinMo 6.5 world. I think I want Windows Phone 7, but the hardware won't be great until the timeframe that Nokia releases a unit - i can't wait that long. The Droid Bionic was the pinnacle...then it faded into the hybrid Targa and anotehr FY quarter away...I need a phone dangit! When older superphones like the Droid X and Incredible hit the $200 mark for a used phone in good condition they generally stay that price for a while. Why don't you just pick one up and then sell it when the "right" phone comes along? I just saw an ad for the Droid Charge on TV. At first I didn't know that it was for the Droid Charge, let a lone for a phone, but at the end it showed "Droid Does 4G" and then it showed "droidcharge.com". two lousy phones coming from the two absolute worst phone manufacturers ever. I don't know how much I would disagree with you on Samsung, but HTC makes fantastic hardware, and their Android lineup has been pretty damn good.